Be the first to share your favorite memory, photo or story of Seth. This memorial page is dedicated for family, friends and future generations to celebrate the life of their loved one. 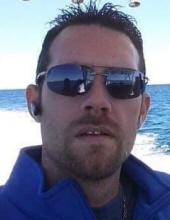 Seth Michael Chemacki, Age 40 of Deerfield Beach, FL, formerly of Grand Ledge, MI, passed away on Wednesday, January 30, 2019 at Broward Health North in Deerfield Beach. He was born on October 8, 1978 in Lansing, Michigan, to Michael Victor and Sylvia Kay (Olmstead) Chemacki. Seth was an amazing Husband, Son, Brother, Nephew, Uncle and friend. Everyone who knew him became family. Seth enjoyed spending time with family and friends fishing, camping, watching football or just “crusin”. Whether in his big, green truck or in his fast, blue Corvette, you were along for the ride when with him. He had a love for his profession as an Electrical Engineer, as well as a love for anything and everything electronic. He is survived by his wife of 14 years, Antoinette “Tonie” Chemacki, Mother Sylvia Kay Chemacki, Brothers; Elton Joseph Chemacki and Jordan Lee (Lindsey Edmiston) Chemacki, In-Laws: Ralph and Sami Picariello, Brother-in -Law, Tony (Jennifer), Nieces and Nephews; Aubrey Edmiston, Adelyn Chemacki, Tyson Chemacki, Amanda Picariello, Savanna Picariello, Jaycee Picariello, and Great Niece, Delilah Picariello. He is preceded in death by his Father, Michael Victor Chemacki in 2016. To send flowers or a remembrance gift to the family of Seth Michael Chemacki, please visit our Tribute Store. "Email Address" would like to share the life celebration of Seth Michael Chemacki. Click on the "link" to go to share a favorite memory or leave a condolence message for the family.